WASHINGTON, D.C. – Engineering studies to include an electromagnetic railgun on a Zumwalt-class destroyer (DDG-1000) have started at Naval Sea Systems Command, NAVSEA’s head said Thursday. The work will do the math to determine if the Zumwalt-class will have the space, power and cooling to field a railgun – likely replacing one of the two 155mm BAE Advanced Gun Systems (AGS) ahead of the ship’s deck house, Vice Adm. William Hilarides told USNI News following remarks at the Office of Naval Research Naval Future Force Science and Technology Expo. “We have begun real studies – as opposed to just a bunch of guys sitting around – real engineering studies are being done to make sure it’s possible,” Hilarides said. The likely candidate for the weapon would be the third planned Zumwalt, Lyndon B. Johnson (DDG-1002) currently under construction at General Dynamics Bath Iron Works (BIW) with an expected delivery date of 2018. 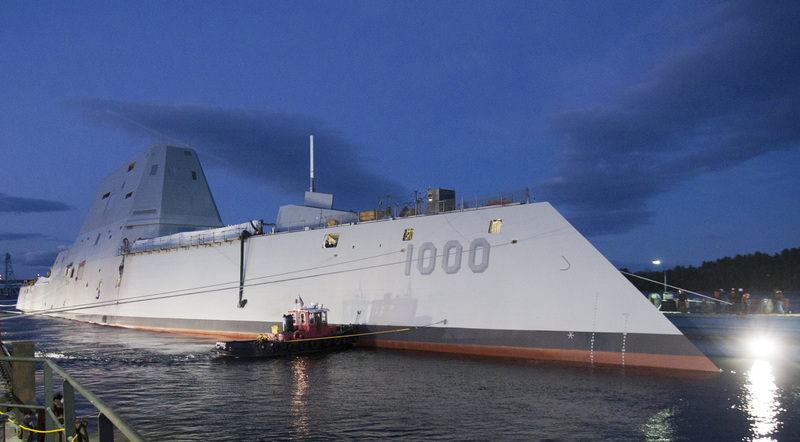 He said the first two ships – Zumwalt (DDG-1000) and Michael Monsoor (DDG-1001) – would be less likely to field the capability initially due to the schedule of testing with the new class. “The team is working diligently now but it would not happen until after delivery of the ships – probably the third ship is where we’d have it,” Hilarides said. 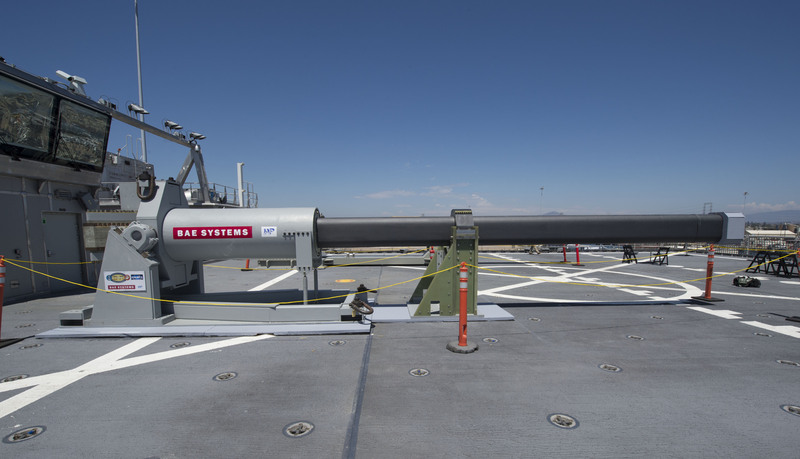 The Navy is in early stages of testing and fielding a railgun – which forgoes the gunpowder in the shells of conventional naval guns and instead uses high powered electromagnetic pulses along a set of rails to shoot a projectile at super sonic speeds. The Navy plans to test a BAE Systems prototype railgun onboard the Joint High Speed Vessel USNS Millinocket (JHSV- 3) next year. The integrated power system (IPS) on the 16,000-ton ships– powered by two massive Rolls Royce MT-30 gas turbines and two smaller Rolls-Royce RR450– allow the ships to route and generate 80 mega-watt power – much more electrical power than the current crop of U.S. destroyers and cruisers. On Wednesday, Chief of Naval Operations Adm. Jonathan Greenert said a Zumwalt would likely be the first ship to get the capability. The inclusion of the railgun does mean a capabilities trade for the ship. “We’ll go do the studies and I suspect they’ll say ‘yes,’ but it’s going to come at a cost of some of the capabilities on this ship – of course,” Hilarides said. The three ship Zumwalt-class were – in part – originally designed to address a gap in naval surface fire support with the AGS firing the Long-Range Land Attack Projectile (LRLAP) at a range of up to 75 nautical miles. Each ship is designed to field two AGS. Zumwalt is expected to deliver to the service next year.